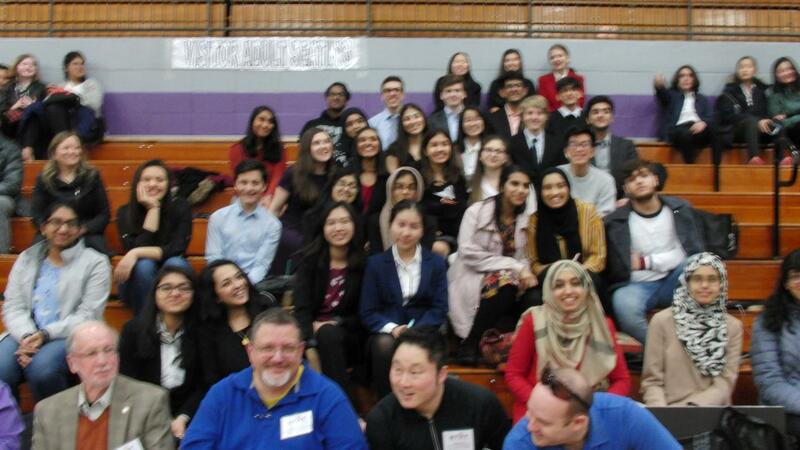 This past Saturday, March 9th, science fair was held at Niles North High Schools. Niles West students in the SIRS class and students in RIOT club showed off their projects which they had been working on for the whole year. Student projects range through all different disciplines of science, anywhere from biology to physics and technology. On the biology side of things, senior Stephanie Sorisho worked on finding a treatment for Alzheimer’s patients. “My project was on how to reduce the severity of Alzheimer’s by using different concentrations of Omega-3. I used a model organism called C. Elegans to carry out the experimentation because they are commonly used to research neurological diseases (such as Alzheimer’s). I’ve been working on this investigation all year, and I ended up qualifying for state and winning best in my category (the health science category),” Sorisho said. Another student with high sights in changing the world is senior Muhammad Afzal. Working his second year with solar panels, Muhammad Afzal has shifted his focus from conventional panels to the new quantum dot technology. “Fossil fuel use is problematic in the world today due to its release of carbon dioxide when burnt. This extra carbon dioxide in the atmosphere causes global warming and CO2 pollution, which are both deadly to the earth; therefore, I am trying to increase the efficiency of commercial solar panels so that solar energy can replace fossil fuels as a major energy source. I am doing this by focusing and filtering the light incident on the panel by using the quantum dots in a process known as photoluminescent downshifting. With research, if this idea is supported, all commercial panels around the world can achieve a peak efficiency of solar energy generation at all times,” Afzal said. Having struggled with error in his data, Afzal hopes to perfect his research by the State competition. “At state, my goal is to have research that can fully support or reject my hypothesis. In reality, I want to see what the results are and how I can change the quantum dots so that they work better than in poorer conditions. This way, when I go to state, I can adamantly say that I learned something from a year-long timespan of research conducted,” said Afzal. Also in the technology field, junior Daniel Cudzich is working on improving battery technology. ” For my project, I’m essentially developing a new type of battery, called the zinc-air battery, that can store several times more power than lithium-ion batteries today. However, they have a nasty tendency to self-corrode, ruining their shelf life and discharge time, so I’m throwing surfactants (i.e. glorified industrial soap chemicals) to stop that corrosion, improve performance, and get them working well enough to introduce into markets like electric vehicles and renewable energy,” Cudzich said. These students have put in lots of hard work to attain research at a college level. Moving on, they have to prepare for state, and underclassman is getting ready to do well next year as well. “A good portion of the students in SIRS moved on to state, so we’re hoping that we can obtain a few best-in-category awards down at Carbondale. We didn’t get to ISEF this year, but with such a good lab program at Niles West, I’m confident we’ll get more students to land in ISEF next year,” Cudzich said. ISEF, being Intel’s international science fair, has students selected at the first, regional round. Although none qualified this year, the underclassman are excited to perfect their research skills for next year. Niles West students are working now to eventually push the frontiers of science. Be sure to wish them good luck at state!